October brings fall leaves, pumpkins — and National Dental Hygiene Month. As you change your summer clothes for a fall wardrobe, it may also be time to change your toothbrush for a new one. 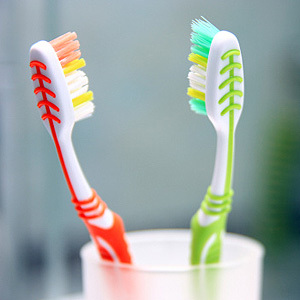 The American Dental Association (ADA) recommends replacing your toothbrush every three to four months. If that sounds like a lot, just think: This small but very important tool gets a lot of use! If you brush your teeth twice a day for two minutes each time as recommended by the ADA, that’s two hours of brushing action in one month. Three to four months of twice-daily brushing makes for six to eight hours of brushing time, or a couple hundred uses. This is all an average toothbrush can take before it stops doing its job effectively. Toothbrush bristles are manufactured to have the right amount of give, tapering, and end-rounding for optimal cleaning. When new, a toothbrush can work its way around corners and between teeth to remove dental plaque. Old bristles, however, lose the flexibility needed to reach into nooks and crannies for a thorough cleaning. Worn bristles may curl, fray or break — and can scratch your gums or tooth enamel. A toothbrush with stiff, curled bristles does not leave your mouth feeling as clean. This may lead to brushing too often or too hard, which is bad for your gums. A good rule of thumb is to replace your toothbrush every season — unless you see signs that you need a new one sooner. For example, if you wear braces, you may have to replace your toothbrush more frequently since brushing around braces puts more wear and tear on the brush. For healthy teeth and gums, make sure your primary oral hygiene tool is in tip-top shape. Taking care of the little things now can avoid inconvenient and expensive dental problems later. Don’t forget to schedule regular professional dental cleanings, and be sure to ask if you have any questions about your dental hygiene routine at home. To learn more about the importance of good oral hygiene, read “Daily Oral Hygiene: Easy Habits for Maintaining Oral Health” and “Dental Hygiene Visit: A True Value in Dental Healthcare” in Dear Doctor magazine.